Tom Petty is a renowned classic rock artist, best known for his work as the lead singer of Tom Petty and the Heartbreakers. Petty’s work as a solo artist, and through his band have earned him both popularity among fans as well as critical acclaim. Tom Petty has been a pillar of the entertainment industry since he rose to fame in the late-sixties. His work has received him a star on the Hollywood Walk of Fame as well as numerous accolades such as 3 Grammy Awards and 3 MTV Video Music Awards. His songs “I Won’t Back Down” and “Free Fallin’” have earned him respect not only from fans of his music, but also from fellow artists. His songs are continually being covered by other artists such as John Mayer, The Foo Fighters, and Keith Urban. Tom Petty is known in the music industry as someone who creates quality music that has the power to stay popular decades after it was first released. 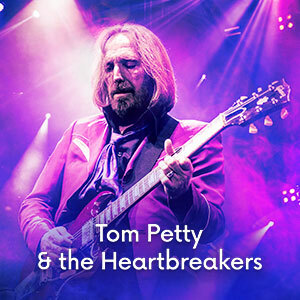 Tom Petty and the Heartbreakers promise that their current tour, starting April 20th and continuing until August 19th will be one that plays both the well-known hits and some pieces that will excite longtime fans of the band. Petty is aware of the desire from fans to hear classics and has no qualms about playing them at his show. Petty and The Heartbreakers have a vast discography, allowing for tours to be unique. Tom Petty has stated that this tour may very well be his last, but bandmates and fans alike are skeptical as he has said this before and has always come back to touring. Tickets for Tom Petty and The Heartbreakers’ 40th Anniversary tour are on sale now!